American Hollies on the Colonial Parkway near Jamestown. Once most of the leaves have fallen in late autumn the woods just light up with our beautiful native holly trees. It is their time to sparkle in the wintery sunshine. Their broad, evergreen leaves are waxy on top and reflect what light reaches them through the forest canopy, and their berries have turned bright scarlet. Unobtrusive throughout the summer, they are among the few forest trees, along with our white pines, cedars, and Magnolias, which remain bright green and covered in leaves throughout the year. 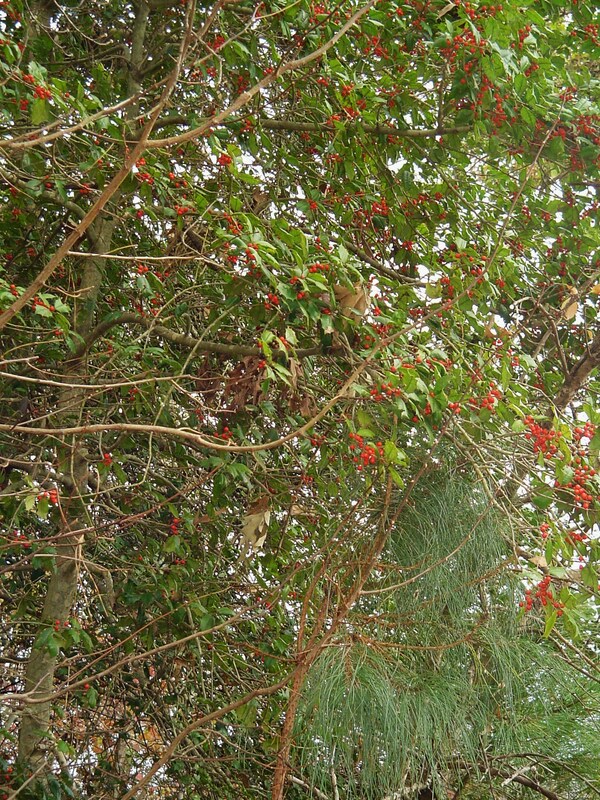 Red berries appear only on female holly trees growing near a male tree. 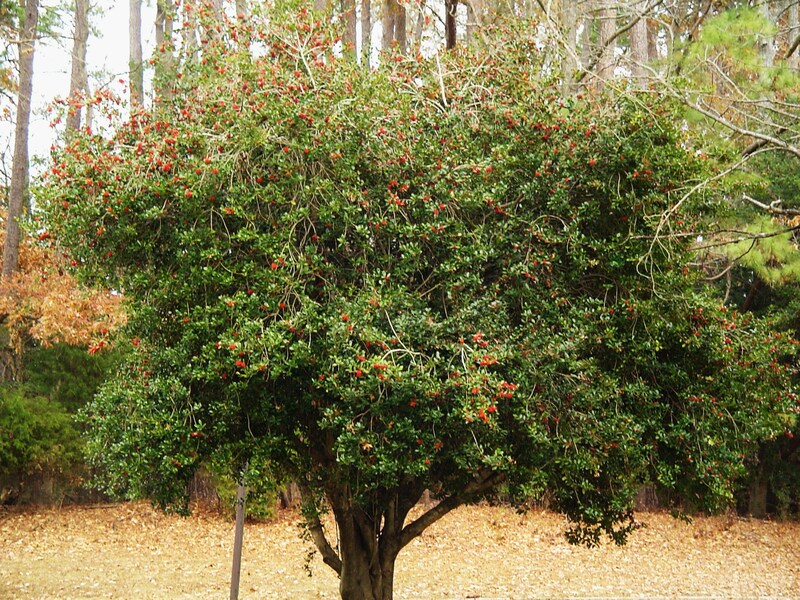 The American Holly, Ilex opaca, is native along the Eastern seaboard in zones 5-9 from southern Connecticut south to Florida, and west into Eastern Texas. A sub variety, I. Opaca “Arenicola,” also known as “scrub holly”, grows in the Florida panhandle. 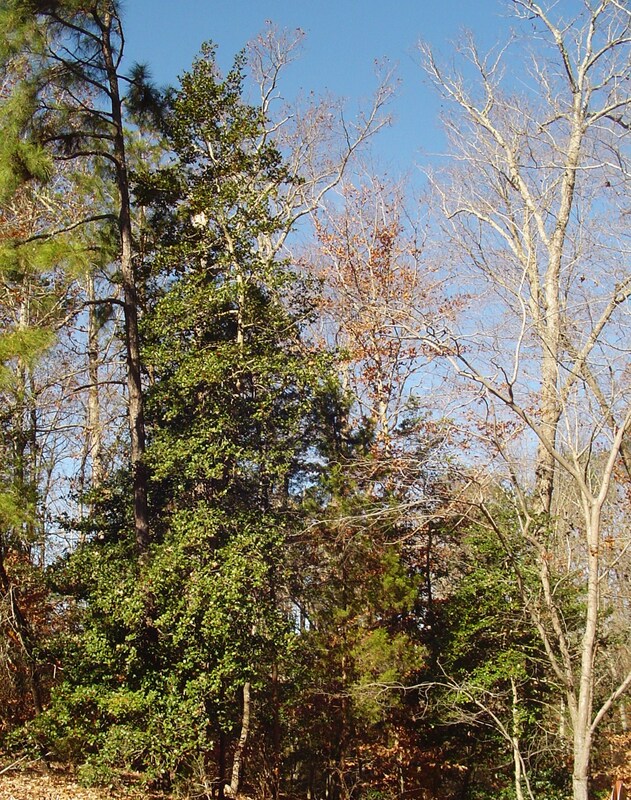 Our native holly in Virginia is very slow growing, but eventually reaches to 50′. Mature holly trees, growing where they can get full or partial sun are majestic, beautiful trees. Although most of our hollies would best be described as shrubs, given the opportunity they eventually grow into beautiful specimens. Holly will grow on a variety of soils, from moist swampy soil to very dry sandy soils. Although they prefer a slightly acidic soil, they can also grow in more neutral ground. Hollies grow extremely well with pines and oaks. 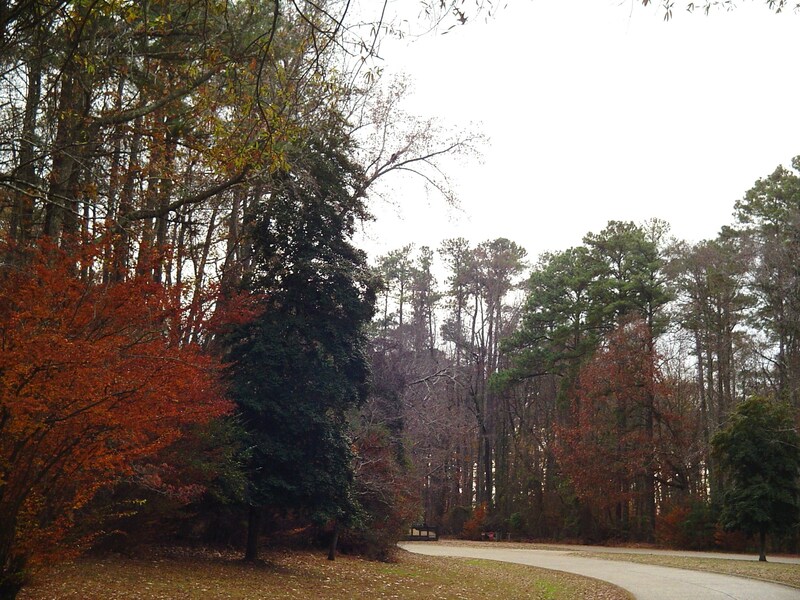 As the pine needles and oak leaves decompose, they keep the soil rich and acidic. Hollies are often found growing with our white pines and with deciduous hardwoods, especially oaks. When planting native hollies, it is good to keep in mind that their eventual spread can reach 20′-40′ at maturity. When given room to grow, full sun, and moist, rich soil, they will eventually become large specimen trees. The reverse is also true. When they are crowded as understory shrubs in a mature stand of hard woods and pines, shaded, and nibbled by deer, they often become stunted and misshapen. 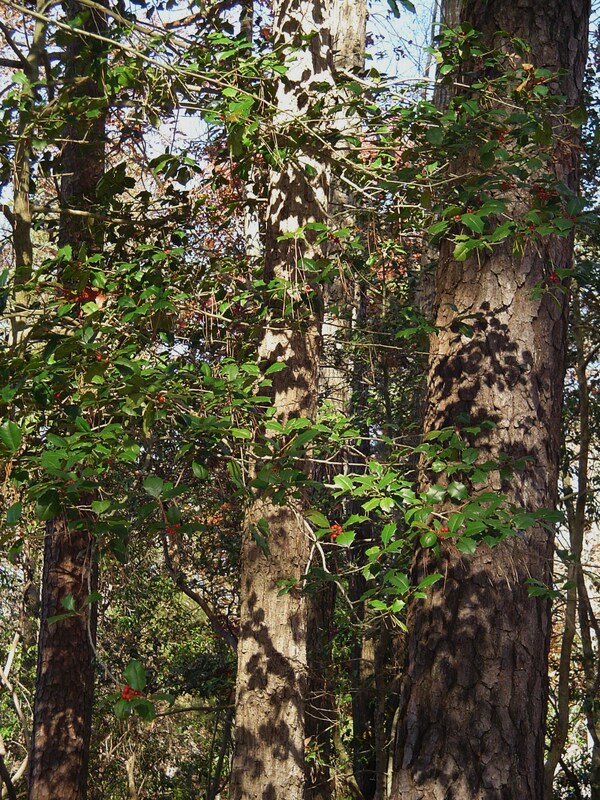 In the garden, many of us limb up hollies once they reach 10′ or more. They can be pruned and shaped very easily, even to be used as a hedge. Pruning is often done in early December so the branches cut can be brought in or used in wreathes for the holidays. Their bright red berries make them favorite winter ornamental plants in the garden. Holly is often the main green used in wreathes and swags. This holly, in our neighborhood, as been limbed up and pruned over the years to create this pleasing shape. When planting new holly trees, make sure to plant several if you hope for berries. The small, yellow green flowers which appear in May or June are an important source of nectar for bees and other nectar loving insects. Cross pollination is necessary for berry production. Holly trees may be male or female, and only the female plants produce the berries, which are an important source of food for many species of songbirds. The female trees need a male nearby for pollination to occur. Hollies are loved by small birds and small mammals not only for their berries, but also for the shelter they provide. Their dense, prickly leaves offer protection in foul weather and are favored nesting sites. Because the berries are favorites of birds, the birds spread the seeds in their droppings, and seedlings inevitably pop up nearby. One often sees whole groves of small holly trees growing in the winter woods, all volunteers growing from bird sown seeds. Hollies large and small are a common sight along the Colonial Parkway. George Washington, and other early American settlers, loved our holly trees and planted them near their homes. Several trees planted by Washington survive today. Native Americans liked to use holly wood, and it is still a favored wood today for its strength and beauty. Holly wood was once used in construction of Scottish bagpipes. Holly is known to have been considered a sacred tree by the European Druids, who used it in their celebrations at the winter solstice. The red berries are symbolic of the sun, which returns in strength and length of day after the winter solstice on December 21 or 22 each year. The Romans believed holly to be sacred to the god Saturn, and so it was a part of their Saturnalia celebrations each December. Another species of holly, Ilex aquifolium, is commonly called English holly or European holly. It also grows as an understory plant in hardwood forests throughout most of Europe, often growing with oak trees. In fact, Ilex is Latin for the “holm oak”, or “evergreen oak.” It was well known and loved in Europe long before the first colonists came to North American in the late 16th century. There are over 400 species of holly worldwide, growing in a variety of different climates. All produce berries in winter, although different species have different colored berries. Small hollies growing under other trees are often stunted or misshapen. 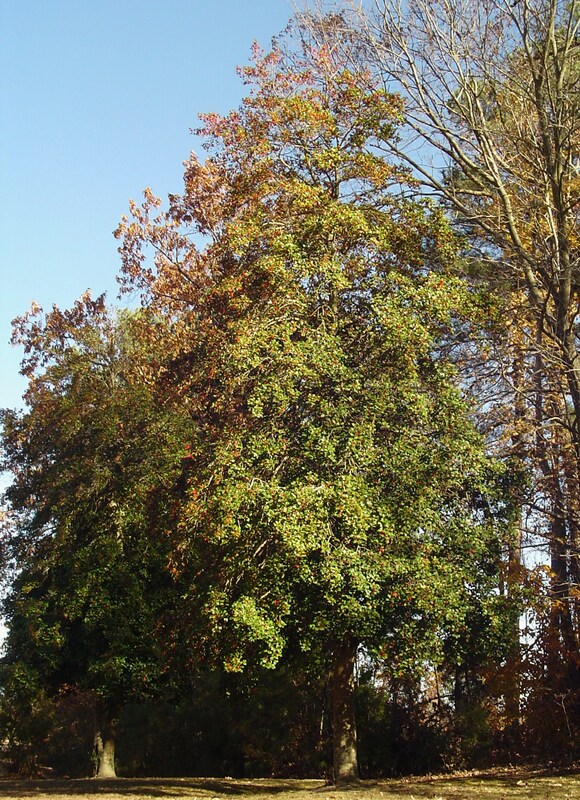 A number of hybrid hollies have also come on the market in recent years with various shades of green leaves, including bluish green leaves, and variegated leaves. Leaves come in different sizes from small to large, and with different leaf shapes depending on the cultivar. Expecting the thorny holly leaves to be “deer resistant”, we planted a hedge of hybrid holly shrubs along the side of our property in our first autumn in the garden. Every one of those shrubs was grazed by deer, who cared not for the thorns on the leaves, and every shrub was dead the next summer. The native holly have a better rate of survival, although their leaves are sometimes grazed as well. 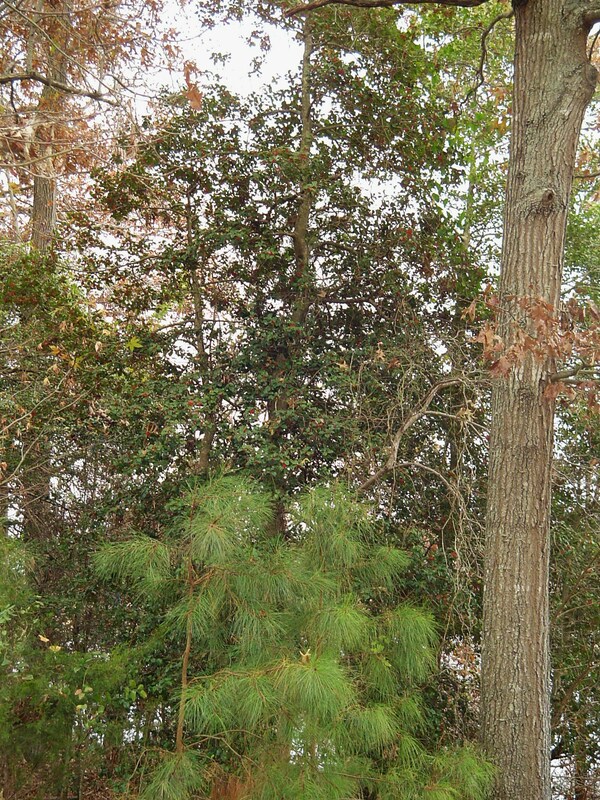 So holly is an excellent shrub or tree to grow in a forest garden. Not only is it a beautiful plant, it offers food for wildlife, provides a good windbreak, offers shade, and is an extremely tough and tolerant plant once established. Whenever I see little seedlings cropping up I protect them and let them grow. I hope that my front wooded part of the garden will one day sparkle and shine in the winter sunlight because it is full of hollies. Now that the wheel of the year has brought us back into winter, our native holly trees sparkle in the forests. 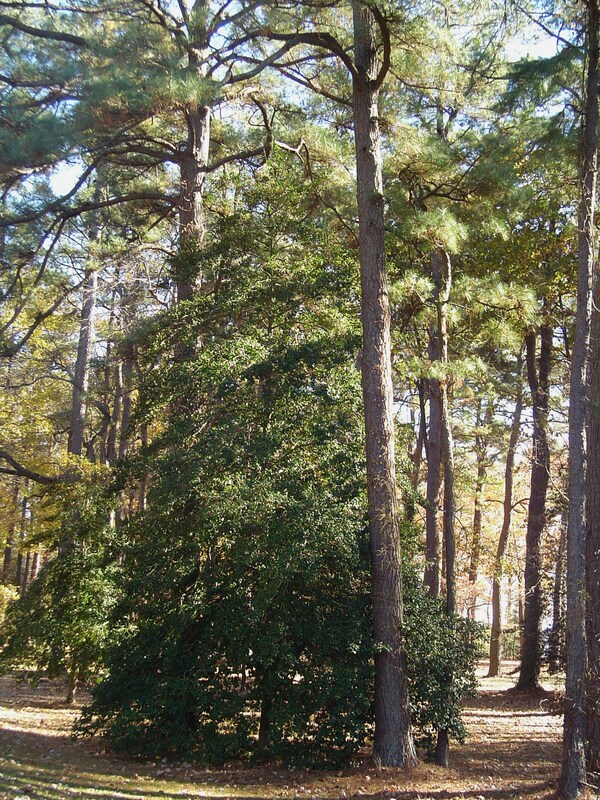 I’ve found this 2013 post about our beautiful native Ilex Opaca in the Forest Garden archives, and offer it for your enjoyment once again.